How do you think an amazing library looks like? When you think to a library, you may think to a common place where large collections of books, digital resources, services maintained by a public or private institution, corporation and so on, a place that for some of us isn’t very attractive and in most cases has nothing special when it comes to design and architecture. But there are of course exceptions of the rule and fortunately these exceptions are met more often today because of the new technology progress and deserves our attention. 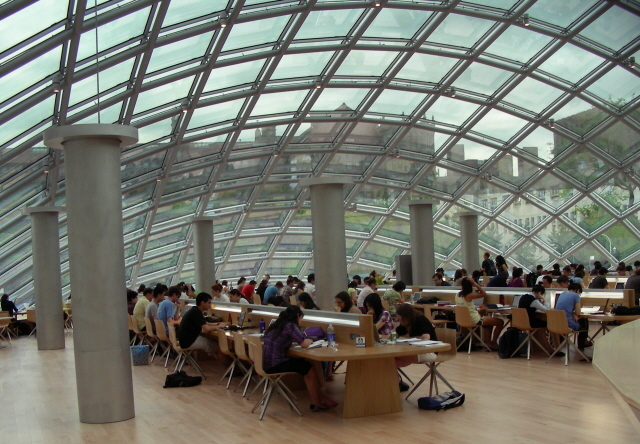 One exemple of courageous work of architecture is Joe and Rika Mansueto Library, located on the Chicago university’s South Campus which isn’t quite like any major research library that has come before The library is named for Morningstar CEO Joe Mansueto and his wife, University of Chicago alumni who contributed $25 million to support library research. Mansueto Library plays host to a massive storage space in what appears to be a slight and deferential building. 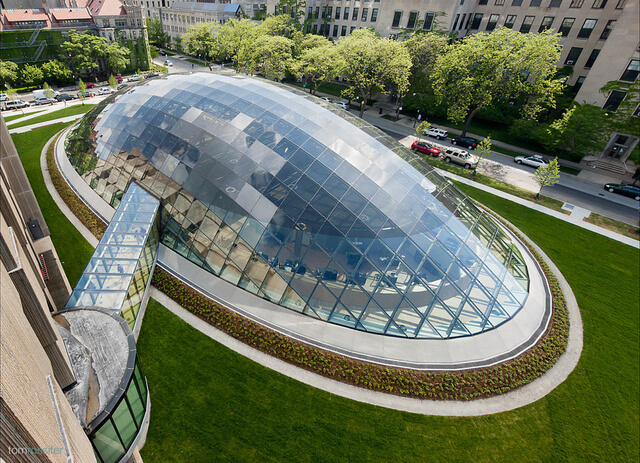 An elliptical glass dome—composed of 691 glazed panels and reaching 35 feet tall at its highest point—encloses a 180-seat reading room and a conservation and preservation department. Around the base of the dome, the glass is transparent to allow unobstructed views, but roughly a third of the way up, a ceramic frit covering 57 percent of the interior surface of the outer lite of each panel helps to reduce glare. The envelope filters out 98 percent of ultraviolet rays and 73 percent of the solar heat, while still admitting 50 percent visible light to illuminate the reading room and conservation areas. Beneath the glass dome is a spectacular, 180-seat reading room that is one of the most breathtaking interior spaces in the city: a soaring, airy space that ennobles the disciplines of study and research. I think when seeing these images you agree that Joe and Rika Mansueto Library is a distinctive library with a modern and original view in terms of both architecture and design and innovative storage system. Take a look at the pictures and video below.